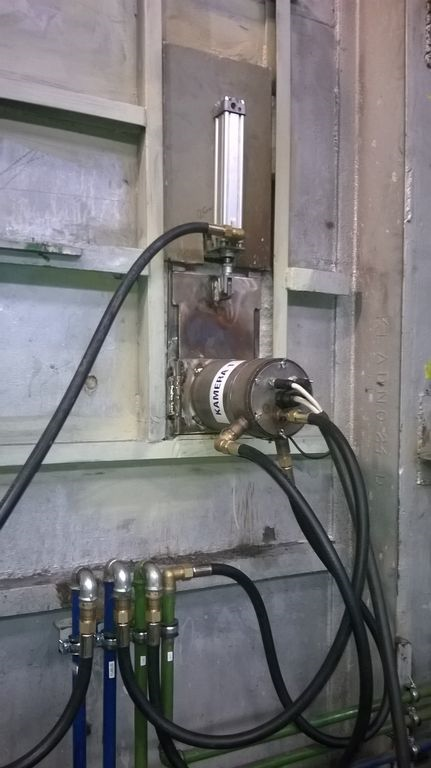 System allows for monitoring of the furnace interior operating in temperatures of up to 1400°C / 1673K. The camera itself is installed into the special tube case on the furnace housing with pre-prepared viewing hole with dimensions approximately 80x60mm – depends on the case armor plate thickness and viewing angle. Outside cover of tube case and the front panel is cooled down with water, while the interior is cooled using the air. When the temperature inside tube case exceed critical limit or the air pressure decrease, the air-operated stainless steel flap automatically closes in order to cover the housing and protect the camera. It is possible to remove the tube case for maintenance or in order to eliminate the heat transfer during the interruption of operation of cooling medium. Image from the camera is displayed to the operators at the control point and can be recorded using the recording device or broadcasted to other observation posts. It is also possible to supplement the system with automated monitoring of amount processed by the furnace or it is possible to perform other requested image analysis. When the thermal imaging cameras are in use it is possible to monitor the course of the material’s thermal field.